Alexandre Borges de Miranda received the Mechanical Engineering Diploma from the Federal University of Minas Gerais (Belo Horizonte, Brazil), in 1985. He worked in the steel industry for three years, as a project engineer (Usiminas Mecânica). In 1990, he received the MSc degree in Mechanical Engineering in the same institution. In 1991 and 1995, respectively, he received the Diplôme d’Études Approfondies and the PhD Degree in Thermique et Energetique from the Institut des Sciences Appliquées de Lyon (France). He worked as an invited professor at the Dept. 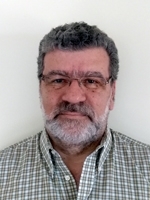 of Mechanical Engineering of the Federal University of Minas Gerais and, since 1998, he has been with the University of Beira Interior (Portugal) where he is an Assistant Professor. His research activities are in Renewable Energies and Energy Efficiency. Monteiro, J. P.; Carrilho, J. A.; Silva, M. C. G.; Miranda, A. B.; Silva, A.: ''3D Printed Pressure Anemometers''; 3D Printing and Additive Manufacturing, Vol. 4, No. 3, pp. 172-181, August / September, 2017. Monteiro, J. P.; Carrilho, J. A.; Silva, M. C. G.; Miranda, A. B.; Silva, A.: ''Design, Manufacture and Testing of 3D Printed Vane Anemometers''; International Congress on Engineering, Covilhã, Portugal, pp. 1-10, December, 2017. Carrilho, J. A.; Silva, M. C. G.; Miranda, A. B.; Monteiro, J. P.: ''Tubo de Pitot para Medição da Velocidade do Ar Obtido por Impressão 3D''; International Conference on Engineering, Covilhã, Portugal, pp. , December, 2015.